There were two WrestleMania matches that were made official last night on Smackdown Live and 205 Live. Both of them are title matches. First up on Smackdown, Rey Mysterio did a promo in the locker room where he said that he will challenge Samoa Joe for the WWE United States Title at WrestleMania. Rey had his son Dominic with him. You may remember Dominic from the famous Rey Mysterio “custody” angle with Eddie Guerrero in 2005 where Rey won custody of Dominic in a match at SummerSlam 2005 (read my review here.) Dominic is all grown up now, he’s a trained professional wrestler that has worked with the likes of Lance Storm and perhaps we’ll see him in a WWE ring one day. At WrestleMania, he’ll be in Rey’s corner. Here’s that interview. It should be a great match, but I feel bad for Andrade, who should be in a WrestleMania match with Mysterio. Those two guys have had some great matches on Smackdown and then in the 4-way at Fastlane, yet it appears Andrade is only going to be in the battle royal at WrestleMania unless something changes. This will also be Samoa Joe’s first WrestleMania match. The other title match added to the show is Buddy Murphy defending the WWE Cruiserweight Championship against Tony Nese, who defeated Cedric Alexander in the Cruiserweight Championship tournament to determine Murphy’s next challenger. You can see the conclusion of the match below. After the match was over, Murphy attacked Nese, who I guess is now a babyface. In other news, after Smackdown was over, we found out how WWE is going to determine the challenger to Asuka’s Smackdown Women’s Championship. It was announced in a post-Smackdown interview with Mandy Rose and Sonya Deville. 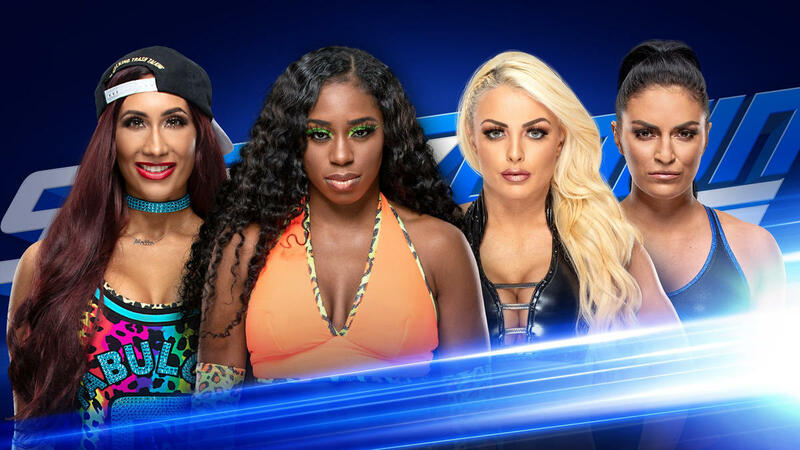 The match will be Naomi vs. Carmella vs. Mandy Rose vs. Sonya Deville in a Fatal 4-Way. The winner of that match will face Asuka for the Smackdown Women’s Title at WrestleMania. If I had to make a prediction, I think we might see a double pin scenario with Mandy and Sonya each getting a pin at the same time (or a pin/submission spot) to set up a 3-Way with Asuka at WrestleMania. That just seems to be where it is going in the storyline. If it’s not that then I would go with Mandy to win. With the Smackdown Women’s Title match added to the show, that makes it a total of ten matches that are official right now with more to come. I’ll have a column up on Friday covering up all of the WrestleMania news and rumors just like I have done for the last three weeks. Daniel Bryan defending the WWE Title against Kofi Kingston is likely to be added. The Women’s Tag Team Title match is expected to be Sasha Banks and Bayley vs. Tamina and Nia Jax vs. Natalya and Beth Phoenix vs. Peyton Royce and Billie Kay aka The IIconics. There are still no matches announced for the Raw Tag Team Titles, Intercontinental Title and Smackdown Tag Team Titles. The rumor is there will 17 be matches at WrestleMania, so we’ll see if it reaches that number or if it’s 13 or 14 matches like the last two years.